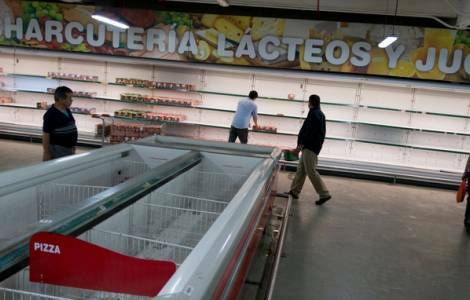 AMERICA/VENEZUELA - Father Aguilar: "Every day children die in Venezuela, there are no medicines and food"
Rome (Agenzia Fides) - The director of the Communication Department of the Episcopal Conference of Venezuela (CEV), Father Pedro Pablo Aguilar, highlighted that Venezuelans are becoming "poorer and poorer" because the country is in a state of "humanitarian crisis". In a brief interview with the press, Father Aguilar reported that "every day berween one to two children die for malnutrition" and that "about 200 people are killed in Venezuela every weekend", there are no medicines and food in the country. In this regard, he commented on the award Venezuela received last year from the United Nations Food and Agriculture Organisation (FAO), for having halved the percentage of people who suffer from hunger. A recognition that, in his view, does not correspond to reality: "Venezuela was recently given an award for helping to reduce the poverty rate, when in fact the opposite happens, but some people have a lot of money and perhaps were able to also buy consciences", he said.